Mt. 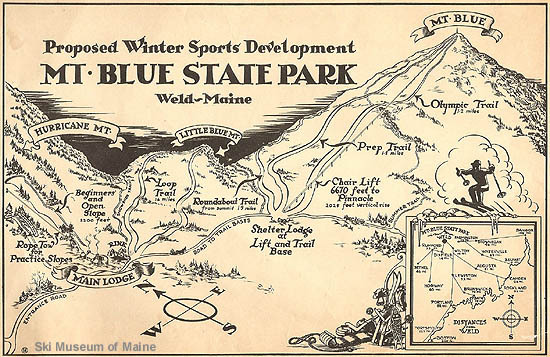 Blue State Park was the site of a proposed sizable winter sports development during the 1940s. With a summit elevation of nearly 3,200 feet, the proposed chairlift on Mt. Blue would have served nearly 2,000 vertical feet. Three trails were planned for the chairlift, in addition to trails on Little Blue and a novice slope and tow on Hurricane Mountain. It is not known how far the state's proposal advanced. The Sugarloaf development likely put an end to the Mt. Blue plans. There are no known remains of the Mt. Blue ski area. Mt. Blue currently features a hiking trail and a partially disassembled fire tower.
" 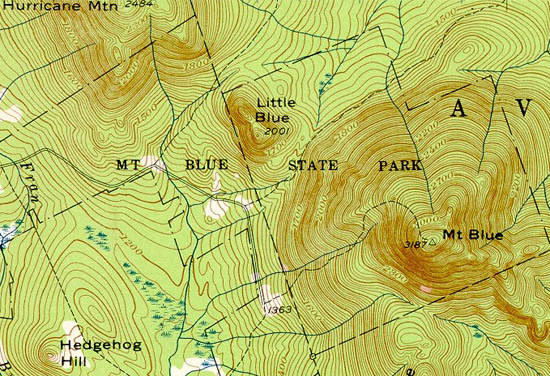 The idea was adumbrated in the late 1940s, but apparently fell by the wayside when a statewide committee (Maine Ski Council) settled on Sugarloaf in 1950 "